Hate to Exercise? Don't Sweat It. 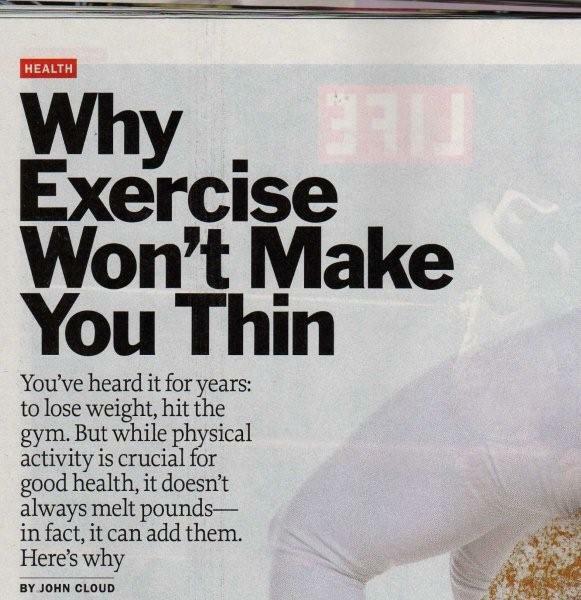 The solution seems obvious: be less physically active and you'll eat less. You don't even need a Harvard degree to figure it out. Not only do I have a sister who's a personal trainer and a brother-in-law who recently biked across the state of Iowa -- I also live with a husband who runs gazillions of miles a week, whose family business is fitness. Life can be so unfair. I definitely never signed up for this one. Personally I don't need to sweat to feel satisfied. At this point, I'd rather walk -- to the beach (or to a bakery.) And mostly I'm okay with my slacker attitude. But sometimes I feel guilty that I don't exercise like a maniac so I can eat like one. That my personal happiness can be in complete opposition to my body fat percentage. I recently joined my sister and her husband on vacation. While they spent two hours a day bonding over back-breaking bike rides, I spent the same time bonding with brownies. So it was incredibly validating to come home and find this issue of TIME magazine. My salvation was right on the cover. The title is a beauty. I couldn't have written it better myself. If you can't read the subtitle, here's the important part: Physical activity... doesn't always melt pounds -- in fact, it can add them. That's the gist of the whole article right there. And it goes on to build my case very effectively. Click to read the whole piece here. The basic theme is found in a sentence simple and short enough to fit on Twitter: Obesity research shows that the role of exercise in weight loss has been wildly overstated. A standard bottle of Gatorade contains 130 calories. If you're hot and thirsty after a 20-minute run in summer heat, it's easy to guzzle that bottle in 20 seconds... From a weight loss perspective, you would have been better off sitting on the sofa knitting. It's no joke -- his article is based on the very latest -- and serious -- research, which indicates that the more you exercise, the more you eat. It includes some complicated stuff about scientific studies -- involving people and of course, rats. Due to a particular substance in their bodies (scientific name= "brown fat") rats have a far greater capacity to process excess calories. Even when force-feeding them, scientists have discovered it's very difficult to make a rat obese -- unlike a human female who can gain 10 pounds merely by opening a container of Haagen Das. The essence of these complicated studies is simple: When it comes to losing weight, exercise is good for you -- if you're a rat. "In general, for weight loss, exercise is pretty useless," says Eric Ravussin, Chair in diabetes and metabolism at Louisiana State University and a prominent exercise researcher. I know what you're thinking. I'm thinking it, too. Louisiana State? A state with probably one of the highest obesity percentages? Not to mention (no offense meant) -- are those the best academic credentials TIME magazine could come up with? I sat up a little straighter when further into the article there's a quote from a guy at Harvard -- Steven Gortmaker, head of Harvard's Prevention Research Center on Nutrition and Physical Activity: "If you're more physically active, you're going to get hungry and eat more." Yale weighs in, too. Psychologist Kelly Brownell ran a lab treating obese patients, where he found that exercise did not lead to long-term weight-loss success. 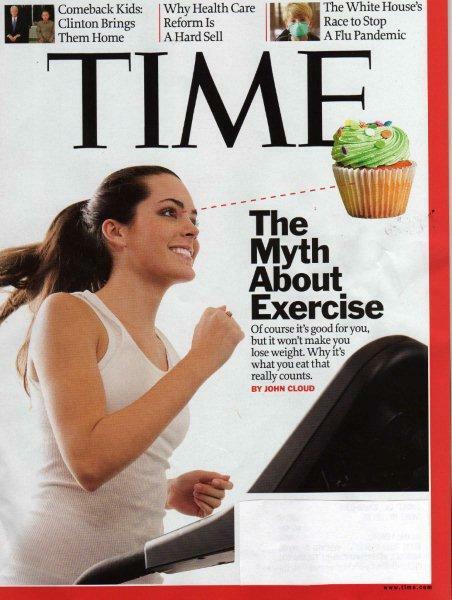 Today, Brownell says : "I would probably reorient toward food and away from exercise." Harvard and Yale -- that's good enough for me. Case closed. All I can say is: It's about TIME.